The world of consumer retail is in the midst of rapid transformation. Traffic in brick-and-mortar stores is decreasing. Consumers are moving away from shopping malls. Traditional advertising—whether via direct mail, TV ads or newspaper and magazine ads—is losing its relevance. Meanwhile, e-commerce is on the rise. In 2010, e-commerce accounted for more than 4 percent of retail sales. By 2016, that number had risen to more than 8 percent. eMarketer now predicts that worldwide e-commerce sales will reach more than $4 billion by 2020. 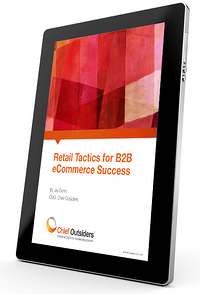 Download this eBook to find out what B2B companies can learn from consumer retail companies.